Learn to duplicate listings and copy them from one eBay account to another. Want to copy a listing from one eBay account to another? Read below to learn how! Open your Listings page and find the listing you want to duplicate/copy. You can use the search bar to find the listing quickly. Select the listing you want to duplicate/copy and then click on the DUPLICATE button beside the PICK A TEMPLATE button. Note: Alternatively, you can find the DUPLICATE button in the listing editor (click on the EDIT button). Here you will select which eBay account you want the duplicate to be created in and if you want the duplicate to include images and description from the original listing. 4. If you click DUPLICATE then the duplicate will be created in the drafts category of the eBay account you selected and this dialog box will close. If you click DUPLICATE & EDIT you will be taken to the duplicate listing for you to edit. 5. 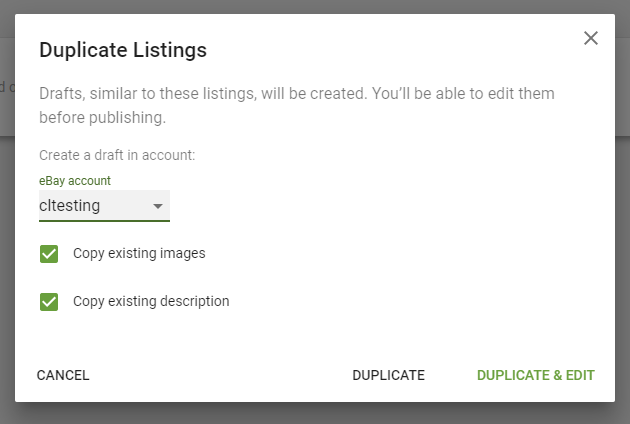 The duplicate will remain as a draft in the drafts category until you are ready to click SAVE & PUBLISH which will publish your listing to eBay. tags: duplicate, copy, sell similar, move between accounts, move listing between account, copy listing, duplicate listing, sell similar listing, copy listing, copy listing between accounts.